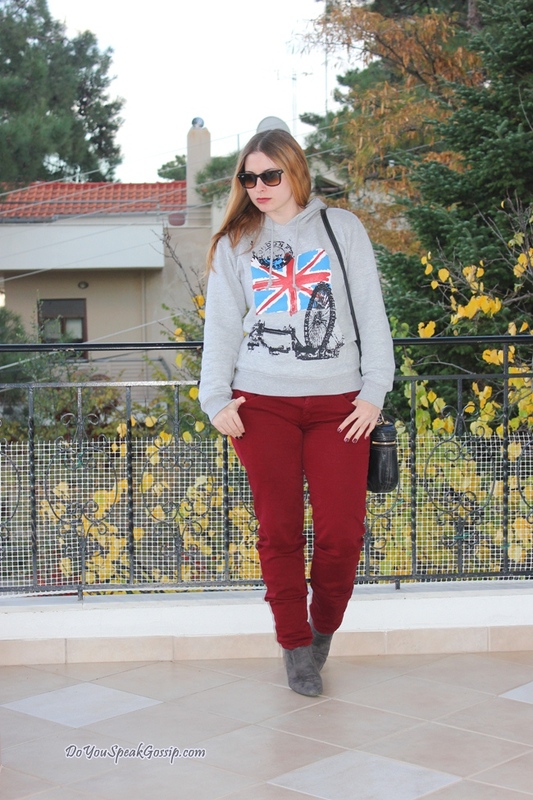 Sweatshirts & burgundy | Outfit - Do You Speak Gossip?Do You Speak Gossip? 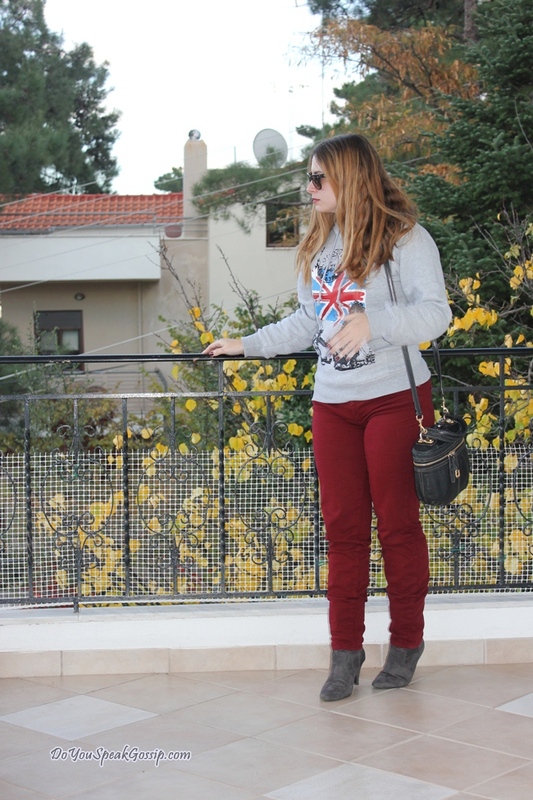 Sweatshirt: Bought from Cool Britannia – London, pants: Zara, bag from Spartoo: D&G, boots: Bershka, sunglasses: Ray-Ban folding wayfarers. Those of you follow me on Facebook and Twitter must have already read by now, that I have dyed my hair red. Not the hue I was going for, but I’ll see what I can do about it. It really needs some getting used to, that’s for sure. I hope you all have an amazing day! See you soon! thank you!!! 🙂 To forema mallon tha to valw prwtoxronia! Alla einai poli aplo! You did it? Red? Wow, can’t wait to see here! These pictures don’t show it! Believe it or not, I think I’m catching another cold. I don’t know, I feel such a lack of energy or will to do anything… always happens when I’m about to go to London – when it was to meet you I felt great, but next weekend I’ll be doing things I don’t want to… you know. I’m a bit angry inside, you know… well, what can I do now. You look amaaaaaaaaazing! 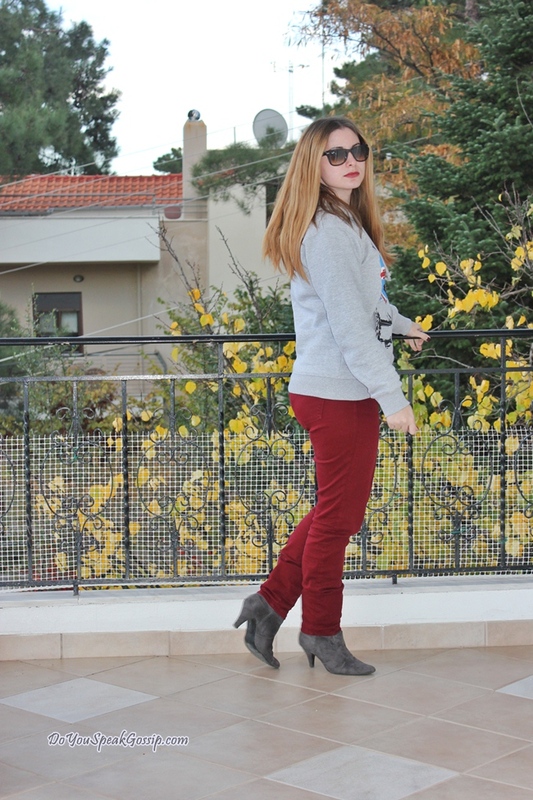 Loved the sweatshirt with the jeans and booties. You always look amazing, and I loved this outfit! Yes I did it. I’m a redhead now. In pics it seems more orange than red, it’s a weird color. I can get used to it so easily. It’s bolder than I would like to be, but we’ll see how to change it. I hope you’ll like it. You ‘ll probably see the new color next week. On my Christmas outfit post. Aww so sorry to hear that you’re catching a cold again! You’ve just recovered from the last one. But I know what you mean. You’re not so happy to be in London again. Well, I hope you won’t catch a cold, and that your stay in London will be pleasant. 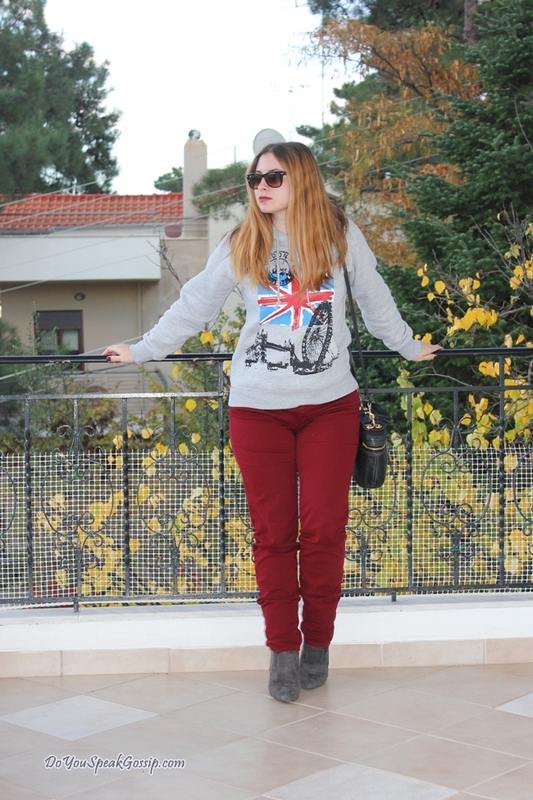 love your sweater!and of course your sunglasses! Thank you! I’ll make sure to show you the full boots in another post. hehe I’m not sure you’re going to like it. I’m not sure I like it either. It’s not exactly what I asked for. Hope I can change it next time. It’s too bold for me. And so different. I already miss my old hair color. Ωραιος συνδυασμος φουτερ με παντελόνι! Ωραίο το burgundy με γκρι! Σούπερ συνδυασμός! Είσαι μια κουκλίτσα! Νεανικό, casual, υπέροχο. Απλό και λιτό…με πολύ ωραία χρώματα. Λάτρεψα το παντελονάκι και ιδιαίτερα το χρώμα του. Ιδανικό για την ηλικία σου… δείχνεις πολύ μικρότερη βρε κορίτσι. Να το προτιμάς συχνότερα. Καλές γιορτές βρε αγαπη! S’euxaristw kai pali gia ta kala sou logia, kai gia to koplimento….nai mou to lene sixna oti moiazw mikroteri apo tin ilikia mou, an kai den eimai kai toso megali… Kai na fantasteis sto gimnasio-likeio oloi me kanane konta sta 18 kai twra akoma me rwtane kapoioi ti spoudazw, kai se akoma “xeiroteres” katastaseis ti taksi paw…hahahah alla oxi den miazw toso mikri me tipota…. Kales giortes kai se sena! Euxomai na peraseis teleia!